Shrek the Musical now out on DVD and Blu-ray! If you’re looking for presents to fill that Christmas stocking, you can now get Dreamworks Animation Shrek the Musical on DVD and Blu-ray™! The Broadway production based on the film has been massively popular, bringing to life the adventures of Shrek and a very chatty Donkey as they set off to rescue Princess Fiona from a fire-breathing dragon – that’s right, there’s a massive dragon on the stage! Shrek the Musical features 17 all-new songs and was filmed live on stage with 10 cameras to really make you feel as if you’re sitting right there in the theatre. Plus, on the DVD, you can get even more involved with sing-along Shrek-tastic songs! 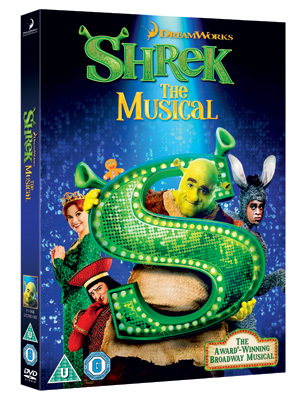 Shrek the Musical is out now on DVD and Blu-ray – click here to get yourself a copy!